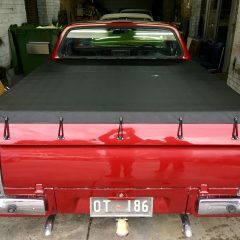 TONNEAU COVER TO SUIT A HK,HT OR HG HOLDEN UTE. *MADE FROM AN ORIGINAL TEMPLATE,TO ENSURE A PERFECT FIT. *SINGLE BUNJI LUGS,EYELETS FOR CONTINUOUS SHOCK CORD OR ‘LIFT-THE-DOT’ FITTINGS ARE ALL AVAILABLE.